I put the top on my Jeep the other day. It’s been off since sometime in early July and I’ve finally given into the fact that it’s very hot outside. It’s been so hot that my phone was overheating on a 5 minute drive to the grocery store. So yeah, the top is on and I am very much anticipating some sort of cooler weather next month. Until then, I will just have to indulge in my favorite frozen treats to make up for it. 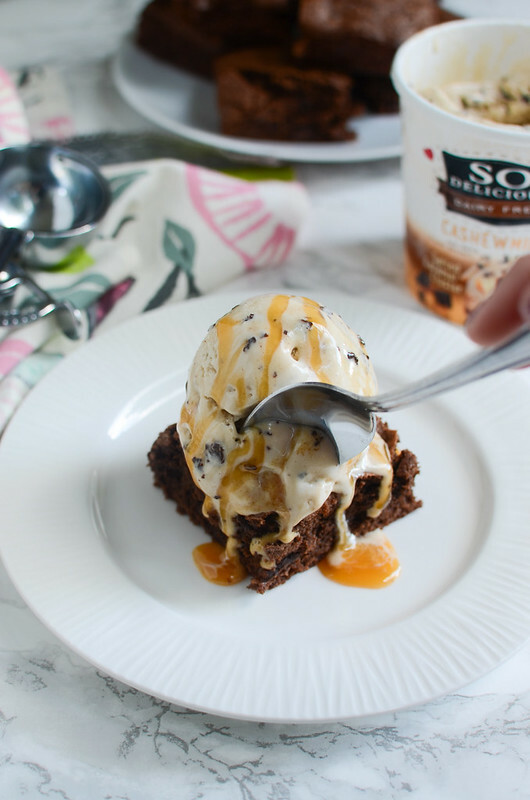 Have you tried the So Delicious Dairy Free® Cashew Milk Salted Caramel Cluster frozen dessert?! I lost my mind when I found it at my Walmart over the summer and have been buying it every week since then. By far the best non-dairy frozen treat EVER. You know I love a sweet and salty dessert more than anything in the world and this totally exceeded all my expectations. The Coconut Milk Simply Strawberry is my other favorite. So good, so creamy, it’s hard to believe there’s no dairy in there. I totally crave fruity frozen treats in the summer and this has been my go-to all summer when that craving strikes. 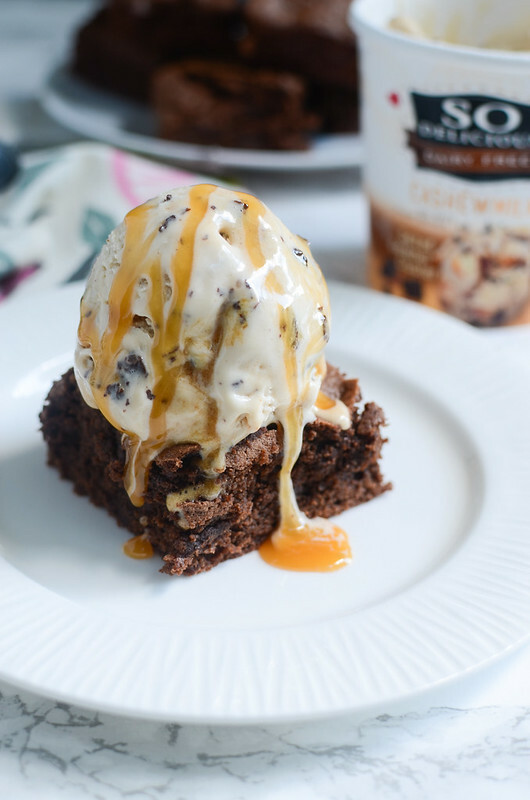 If you live a dairy-free life, So Delicious Dairy Free® should be your most favorite brand on earth. Their products are certified vegan (which means dairy-free and egg-free!) and Non-GMO Project Verified. They use zero artificial colors, flavors, or preservatives and no high-fructose corn syrup. I love that they only use the highest quality ingredients and really strive to do the best for people and our beautiful planet. And amazingly delicious. Go pick up some So Delicious Dairy Free® Cashew Milk Salted Caramel Cluster and thank me later. 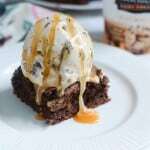 To pair with my So Delicious Dairy Free® Cashew Milk Salted Caramel Cluster I wanted to make some gluten-free brownies. Did I mention that the So Delicious Dairy Free® Cashew Milk Salted Caramel Cluster is gluten-free? I love these brownies so much. I can’t tell you how many times I’ve made them in the last year or so. They are dairy-free, gluten-free and perfect with a scoop of So Delicious Dairy Free® Cashew Milk Salted Caramel Cluster and a drizzle of dairy-free caramel sauce on top. 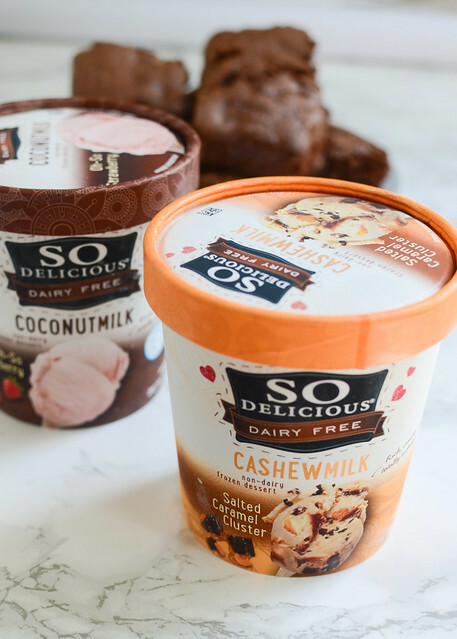 You can find out more about So Delicious Dairy Free® and all the great work that they do here. 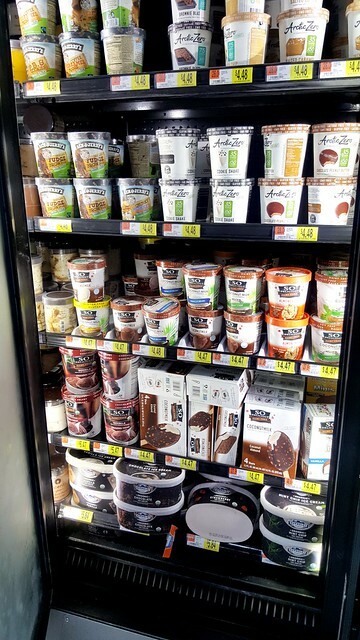 Let me know in the comments if you’ve tried any So Delicious Dairy Free® products and which ones are your favorite! Preheat oven to 350F. Line an 8x8-inch pan with parchment paper. Set aside. In the bowl of a stand mixer fitted with a paddle attachment, beat butter and sugar together until combined. Add eggs, one at a time, and vanilla. In a separate bowl, whisk together cocoa powder, baking mix, baking powder, and salt. Slowly add this mixture to the butter mixture and beat until just combined. Use a rubber spatula to fold in the chocolate chips. Transfer the mixture to the prepared pan and smooth out the top. Bake 33 - 35 minutes or until a toothpick inserted into the center comes out mostly clean. To make the caramel, combine brown sugar, sugar, and cashew milk in a small saucepan over medium heat. Stir until the sugar has dissolved and the mixture has thickened slightly, just a few minutes. Stir in vegan butter until melted. 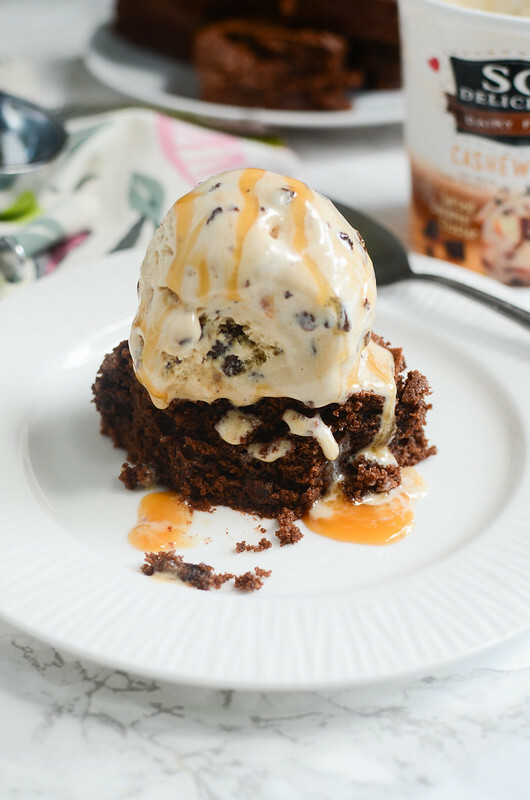 To serve, slice brownies and top each brownie with a scoop of So Delicious Dairy Free® Cashew Milk Salted Caramel Cluster and a drizzle of caramel sauce. 2 Responses to "Gluten-Free Caramel Brownie Sundae"